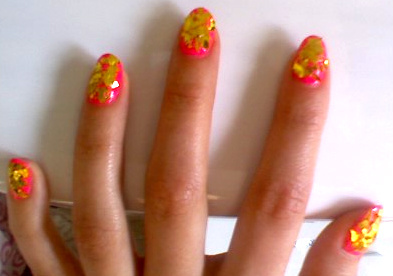 I used China Glaze Hot pink and peices of Gold aluminum! I used Gold Glitter by China Glaze and Black Nail art to make the tiger stripes! I used Pure white by China Glaze and Neon Hightlighter by China Glaze , then i made the dots with a dot tool! This entry was posted in Neicy Hair and Nails, Neicy's Nails. Bookmark the permalink.